Yikes! Is a cat nose bleed something you can ever treat at home — or do you always need to see a vet? Plus, what’s causing your cat’s nose bleed? We’ve all been lounging on the couch with our kitty when, suddenly, she lets out a sneeze. With her eyes squinted shut and her nose deliciously crinkled, it’s hard not to find your cat’s sneeze downright endearing (even though your cat might freak out a bit when the situation is reversed and you’re the one hollering “achoo!”). 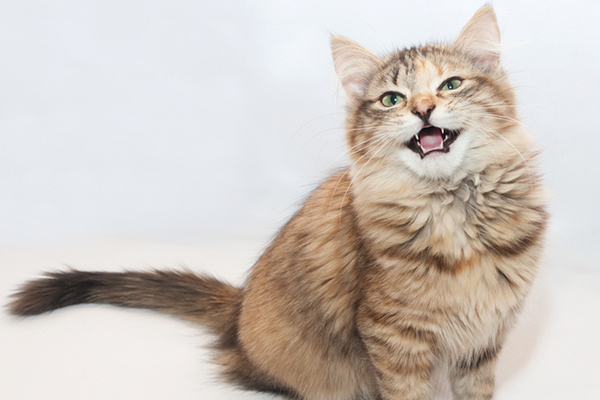 But let’s imagine, for a moment, that your kitty’s sneeze is accompanied by — eek! — a cat nose bleed, and her forceful expulsion of air also releases a smattering of blood. Surely it’s time to panic, right? Indeed, a cat nose bleed (a.k.a. epistaxis) can be a super-scary situation for feline parents, and sometimes the causes behind a cat nose bleed are serious. Other times, however, a cat nose bleed has a fairly straightforward and easily resolvable cause. Here’s what you need to know about identifying and treating a cat nose bleed. What does a cat nose bleed look like? 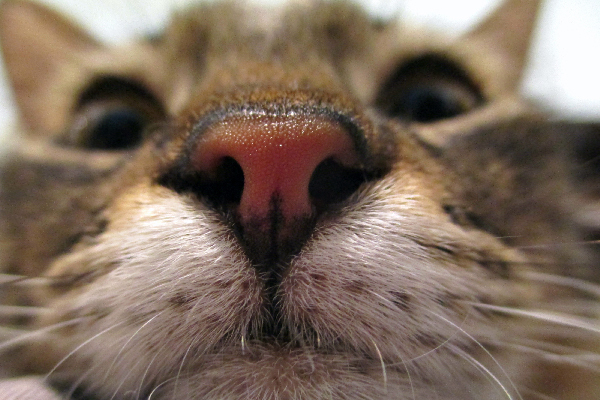 Is your cat’s nose bleeding? What should you do? Photography © Christian Buch | iStock / Getty Images. As a kid, I went to school with someone who got frequent nose bleeds, and, unfortunately, it gushed like someone had turned on a faucet inside his face. A cat nose bleed is unlikely to be this dramatic, though you will probably spot some blood or bloody discharge around your cat’s nose. Other symptoms of a cat nose bleed include snorting, sneezing blood, weakness, lethargy, and pawing at the nose or face. If you notice your cat has a nose bleed, get her to the vet right away. What causes a cat nose bleed? As mentioned, a cat nose bleed has several potential causes. In serious cases, a cat nose bleed can be caused by organ failure or cancer, especially leukemia or other blood disorders. A cat nose bleed could also indicate that your kitty has a condition that prevents her blood from coagulating normally, known as coagulopathy. More commonly, respiratory or sinus infections, a foreign object lodged in the nasal cavity, or head/facial trauma may cause a cat nose bleed. Unseen injuries like snakebites, high blood pressure or stress/anxiety are other culprits. How do you treat a cat nose bleed? The treatment for a cat nose bleed varies depending on the cause — though in pretty much every case, you’ll want to seek immediate veterinary attention. In less severe cases, a cat nose bleed will only require interventions to stop the bleeding, such as using an ice pack to treat swelling, injury or inflammation. If ice alone doesn’t stop the nose bleed, gauze may be used to provide pressure and slow blood flow down. 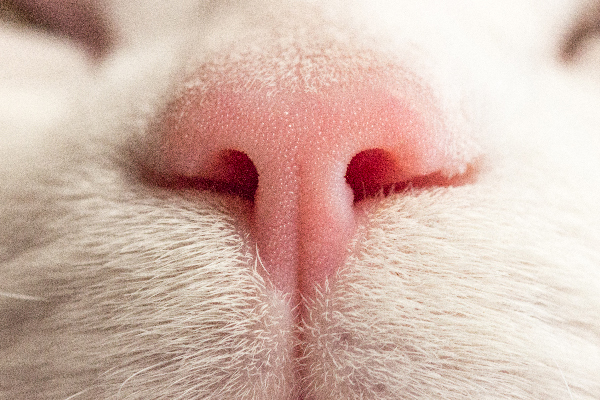 In the case of an infection, high blood pressure or stress/anxiety, the cat nose bleed in question might require antibiotics or medication to mitigate these conditions. Like humans, cats will likely need to take blood pressure or anxiety medication long term, which means you’ll want to stock up on pill pockets. If your kitty seems weak or lethargic when you take her to the vet for a nose bleed, she might get IV fluids to restore proper hydration. “I usually treat by treating the underlying cause [with] nose drops with a saline drop like Ayr or Ocean drops,” Dr. Taylor says. In more severe cases, a cat nose bleed may require surgery to remove a tumor or a foreign object that’s become lodged in the nasal cavity. A cat nose bleed caused by severe anemia or another blood disorder may call for a blood transfusion. The recovery time for a cat nose bleed will vary based on the type of treatment your cat receives. Follow your vet’s instructions exactly, and take time to give your kitty the extra cuddles and attention she needs to heal. Can you ever treat a cat nose bleed at home? Because a cat nose bleed has so many possible causes, some of which are very serious, seek veterinary attention if you notice one. But before you go to the vet, there are a few things you can do about a cat nose bleed at home. First, try to keep your cat calm, as higher blood pressure can make your cat’s nose bleed worse. You can also place an ice pack on the bridge of your kitty’s nose. Most importantly, wait for veterinary intervention before giving your kitty any kind of medication. Tell us: Has your cat ever had a nose bleed? What was the culprit? Is a Dry Nose a Cause for Concern? Why Does Your Cat’s Nose Change Color? We are so, so sad to hear this. Thank you for rescuing this kitty and showing her love and compassion. One of ours had a nose bleed when he was little, he sneezed a couple of times and the other time the nose hit the floor and it started bleeding. I called the vet and we took him and his brother there. Tought it could be good if it is cat flu they better get help both of them. This is 10 years ago now. Hi! My cat has been sneezing blood. It started in the summer when we moved from our apartment to the country side. We have a big house and garden and during the summer he spent alot of time in the garden (never went outside of it). He also had a tick once wich we removed safely. He sneezes and there is spots of blood on fhe foor-the bleeding stops straight away. We thought he had some allergies from the plants outside. But the sneezing still goes on (not every day, 2-3 day intervals, once a day). This summer I started feeding him mostly raw meat. He doesn’t have any other symptoms. Actually he is a really happy kitty. Good appetite, lots of energy, loves to play and be outside, purrs alot. He is a scottich fold breed. I will contact a vet for sure, but is there any advice or info you can give me- what could be the underlying cause. We suggest taking your cat to the vet ASAP. We hope your cat feels better!